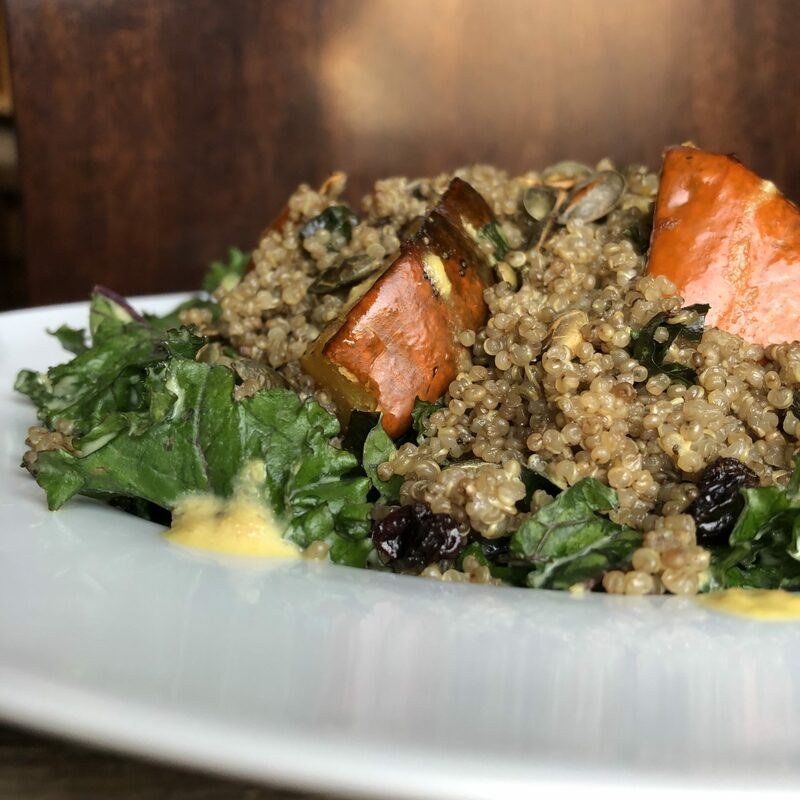 Using Manitoba grown quinoa from Tamarack Farms, their "nutty brown" variety has a richer flavour that pairs so well with roasted winter squash! Preheat the oven to 425*F. Line a rimmed baking sheet with parchment paper. Slice the squash crosswise into 3/4-inch-wide pieces. Place them in a single layer on the baking sheet and brush with oil of choice. Season well with salt & pepper. Roast the squash for 30 minutes, flipping them over halfway. The squash is done when the edges are golden brown and the middle can easily have a fork pierce through. While the squash is cooking, cook 1 cup of quinoa with 1 1/2 cups of water or stock in a pot on the stove. Bring to a boil. Cover with a lid and reduce the heat to a simmer for 15-20 minutes. Prepare a lemon-tahini dressing, the blog Oh She Glows has a good one, or others can be used or bought as well. Place the kale in a large bowl and pour 2-4 tablespoons of the Lemon-Tahini Dressing over top. Massage the kale for 30 seconds, then let it sit on the counter for 10-15 minutes so the dressing can soften the kale leaves. To assemble, place the kale in the center of each plate. Spoon quinoa over top. Then sprinkle the chopped basil, currants or cranberries, roasted pumpkin seeds, and roasted squash on top. Drizzle with the remaining dressing.